Hi Guys! Hope you are all having a wonderful weekend. Are any of you gardeners? I am and a little bit obsessive about gardening. Today I am going to get busy in the garden and what a huge job it is for such a small garden. When we moved in, there was nothing but gravel, bark and a few ugly rocks to look at (I will show you before and after photos once I have finished it). So I am busy trying to get our cottage garden finished before summer comes. Oh how I pine for lazy summer days... so I can sit in the sun, admired my garden with a yummy cocktail and a good book! I wish I was more into gardening. When we bought our cottage it came with a stunning established cottage garden and I'm so scared I'm slowly killing it. It still looks good... but I do know I should be putting more into it. Love the accompanying drawing... so gorgeous! Hi Liz!! Thanks heaps for your comment. Yes it was so exciting to be on print and pattern. I love her blog so it was so great to be a part of it. Your work is absolutely incredible!!! Im so glad you wrote a comment on my blog, so I got to see your work. Its just gorgeous. Thanks again, have a great week. Clare - it was lovely to find your blog and I am so wrapped you like mine. I would be so chuffed if you blogged about me! Thank you for your wonderful comments!! oh! wonderfull blog! thanks for your comment! 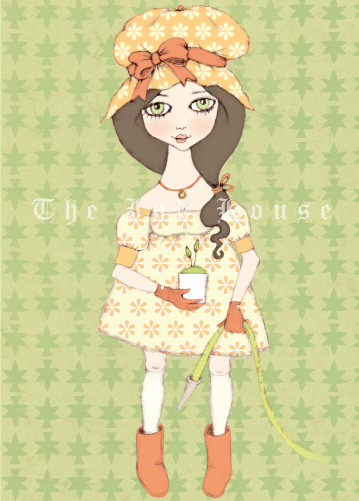 the girl of th illustration is so cute! the colors are amazing! Hey Lizzle! haha - well, I hope none of MY gardening advice will lead to dead plants :) I'm sure your garden will look amazing once it's all done... Then I can come over for BBQs hahah :D Love your gardening girl illo too, she's really sweet and gorgeous Spring colours.